Thor – Ragnarok movie starts with Thor looking for Infinity stones gets imprisoned by fire demon Surtur. Surtur reveals that Thor’s father Odin is no longer on Asgard. Thor is also informed that the realm would be destroyed in Ragnarök, once Surtur unites his crown with the Eternal Flame that burns in Odin’s vault. Surtur is defeated by Thor who then believes that Ragnarok has been prevented. Thor arrives at Asgard and find out that Odin (his father) is gone. Loki and Thor combines forces, take help from Doctor Stranger to trace out their father who is at Norway. Odin informs that he is dying and after his death, Hela (first child of Odin) will be freed. Hela is set free after Odin’s death and now wants to expand the kingdom. Hela destroys Thor’s Hammer and throws of Thor & Loki to die in space while traversing back to Asgard via the Bridge. The next part of the movie gets fun-filled and is also loaded with lots of action sequences. Thor is thrown off to an island named Sakaar where he is picked up by a bounty hunter Scrapper 142. The planed is ruled by Grandmaster, who makes Thor as one of the gladiators. Thor is set to battle Hulk who does not remember Thor and battles along. There are a lot of funny exchanges between Hulk and Thor. Thor finally helps Hulk transform back to Bruce Banner by showing him video of Natasha Romanoff. The next sequence of events shows how Thor along with his gang go back to Asgard and battle Hela. Even after forces combined (Thor, Loki, Valkyre & Hulk), they find it hard to defeat Hela & her army of dead. Loki bring back Surtur back to life by using the eternal flame. The next sequence of events shows Hela being destroyed along with Asgard. Thor rescues the citizen of Asgard and decides to relocate to Earth. It may be a very detailed summary of the movie, but I think the movie has many more things that are hard to explain. The best part about the movie is the idea of combining Comedy with Action. Thor meets Hulk for the first time in Sakaar battlefield and tried to have pep talk and is in turn thrown left & right similar to manner in which Loki was handled in Avengers movie. The time when Bruce Banner jumps off the spaceship to land on Asgard we assume that he would be transformed to Hulk. But instead Bruce fall on the planet with a loud thud. Every scene involving Grandmaster is simply funny. Loved the performance of Christ Hemsworth as Thor, Mark Ruffalo as Hulk, Cate Blanchett as Hela, Tom Hiddleston as Loki and Jeff Goldlum as Grandmaster. 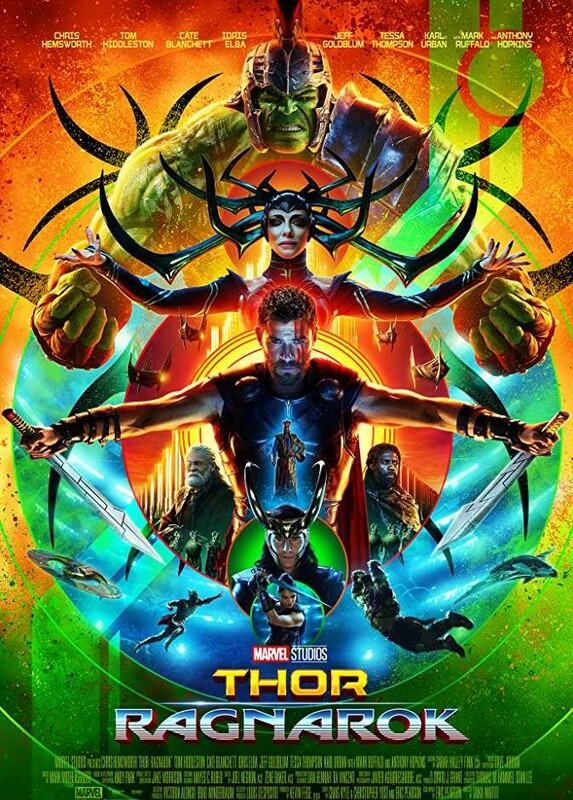 Thor – Ragnarok is one of the action packed & fun-filled Super hero movies I have watched in a while now. I initially had my appreciations for watching this movie. This is one movie that kids will love it for all the comedy scenes. I am waiting for the next series of Thor movies which seems quite evident after the battleship carrying Asgard Citizens is intercepted. Posted on December 5, 2017 June 20, 2018 by nameeshn24Posted in EnglishTagged Action, Adventure, Avengers, Blogger, Cate Blancett, Chris Hemsworth, Comedy, Highlight, Hihglight, Idris Elba, Jeff Goldblum, Ragnarok, Tesa Thompson, Thor, Tom Hiddleston.